The venerable UCSD pianist, Cecil Lytle, chooses a different theme each year for the annual Lytle Scholarship Concert, raising funds for UC San Diego’s Preuss High School. The theme for this year’s 23rd concert was “Jewish Music, from Bessarabia to Broadway.” It was dedicated to the congregation of the Tree of Life Synagogue and the people of the Squirrel Hill neighborhood of Pittsburgh, Pennsylvania. Lytle played a pivotal role throughout the program, accompanying vocalists, Cantor Mark Childs and his son, David Childs, Eva Barnes and Deborah Davis; performing Rachmaninoff transcriptions for piano of Fritz Kreisler’s Liebesleid and Liebesfreud; and collaborating with clarinetist Anthony Burr in Leonard Bernstein’s Sonata for Clarinet and Piano. The first half of the program was narrated by two Jewish professors, Eva Barnes, of UC San Diego’s Theater Department, and Peter Gourevitch, Professor Emeritus of its Political Science Department. They spoke about their Eastern European Jewish ancestors. After intermission, the Second Avenue Klezmer Ensemble took center stage. Their five members, Deborah Davis, vocals and co-director; Ellen Weller, piano, flute, soprano sax; George Svoboda, guitar; Bert Turetzky, contrabass; and Bob Weller, drums, performed klezmer and Ladino selections. They were outstanding, especially in light of the fact that their co-director, Robert Zelickman, clarinetist, was unable to perform with them because of a family medical emergency. UC San Diego Music Faculty Professor, Anthony Burr, stepped in to replace Zelickman in the Bernstein Clarinet Sonata on 24 hours notice, and Ellen Weller, listed in the program as playing piano, performed also on flute and soprano sax, to fill in for the missing Zelickman. Cantor Childs opened the program, singing a version of Hine Matov and inviting the audience to join in. He is a UC San Diego alumnus, currently serving Congregation B’nai B’rith in Santa Barbara. His resonant baritone inspired his three liturgical selections, Ben Steinberg’s Esa Einai, Bob Remstein’s Sim Shalom, and Israel Alter’s Chasdei Hashem. The second song was a duet with his son, David Childs, a cantorial intern at Los Angeles’ Sinai Temple. Lytle’s Rachmaninoff renditions followed, played with secure technique and virtuosic bravuro. Eva Barnes, in a light soprano, rendered Irving Berlin’s Blue Skies and Harold Arlen’s Over the Rainbow. Bernstein’s Clarinet Sonata received a consummate reading by Burr and Lyle, with the jazzy elements receiving the required swagger and lilt and the slower sections enhanced by a lovely sustained clarinet legato. Davis’ two Gershwin comedic songs, Mischa, Jascha, Toscha, Sascha and Blah, Blah, Blah were delivered with flair, and the klezmer music and two Ladino selections received enthusiastic responses from the audience. Bert Turetsky performed an original solo, Of Love and Loss, inspired by his mother. As the most frequently recorded bass in America and professor emeritus of UC San Diego, he continues to perform with remarkable command of his large instrument. The Second Avenue Klezmer Ensemble concluded with a rousing , Abi Gezunt, leaving their listeners with healthy upbeat smiles. 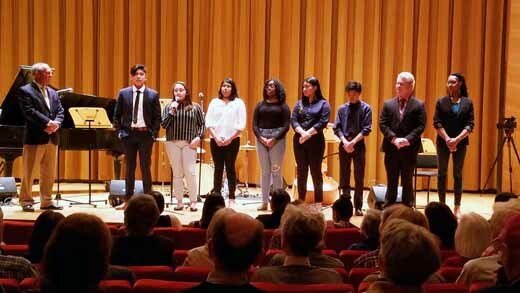 At intermission, six students and an alumnus of the Preuss High School, now in its 21st year, were introduced by the school’s principal, Scott Barton. This college preparatory charter school serves promising students from low income, first-generation families. Funds from the concert provide scholarships to Preuss graduates attending UC San Diego. The high esteem in which these Lytle concerts are regarded was evident by the attendees. In the audience were such luminaries from our community as Congressional Representative of the 53 District, Susan Davis and her husband, Steve; co-founder of Qualcom, Irwin Jacobs and his wife, Joan; founder of the UC San Diego Political Science Department Sandford Lakoff and his wife; Democratic activist Lucy Goldman and her daughter, Arts Reporter for the Los Angeles Times, Leah Ollman. Professor Lytle, who wrote the printed program’s erudite program notes, as well as performed throughout the afternoon, has had a long history of leadership at the university. He served as chair of UC San Diego’s Department of Music, provost of the Thurgood Marshall College, and was one of the chief founders of the Preuss School. He was awarded UC San Diego’s Revelle Medal in 2015 for his outstanding work. This program was another example of his creativity and vision. Republished from San Diego Jewish World.